Developmentally appropriate practice is an early childhood education standard that was first described by the National Association for the Education of Young Children. According to NAEYC, developmentally appropriate practice is matching the learning environment—the physical set-up, materials, schedule, curriculum, teaching methods and so forth—to the developmental levels of children. It means understanding the developmental changes that typically occur from birth through age eight (and beyond), variations in development for individuals and how we can best support their learning and development during these years. There is no magic formula for developmentally appropriate practice. Educators make decisions day by day, minute by minute, based on knowledge of how children develop and learn, the individual children and families in question and the environmental, social and cultural context (Bredekamp & Copple, 1997). Developmentally appropriate practice in early childhood environmental education means making program choices that emphasize and support both the individual and collective abilities of children. 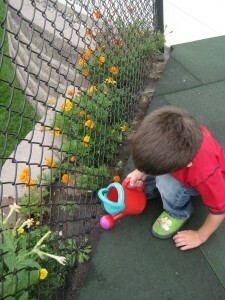 What are the benefits of using developmentally appropriate practice? Children have better comprehension and retention. Because material is presented in a manner best suited to their developmental stage, the material is absorbed better than it would have been if it was designed for older children. There are fewer struggles to get children to engage in the program. Material presented in a developmentally appropriate manner is more interesting to students and naturally grabs their attention. Children and adults can learn together. Following a child’s lead often takes us in a much more interesting direction than any adult prescribed curriculum. More divers programming can reach more students. Creating developmentally appropriate materials requires more diverse forms of interaction and presentation and reaches more diverse learning styles. Used with permission – Oltman, M. 2002. Natural Wonders. A Guide to Early Childhood for Environmental Educators. Minnesota Early Childhood Environmental Education Consortium. SEEK – Minnesota’s home of environmental education resources Click on the Natural Wonders PDF.